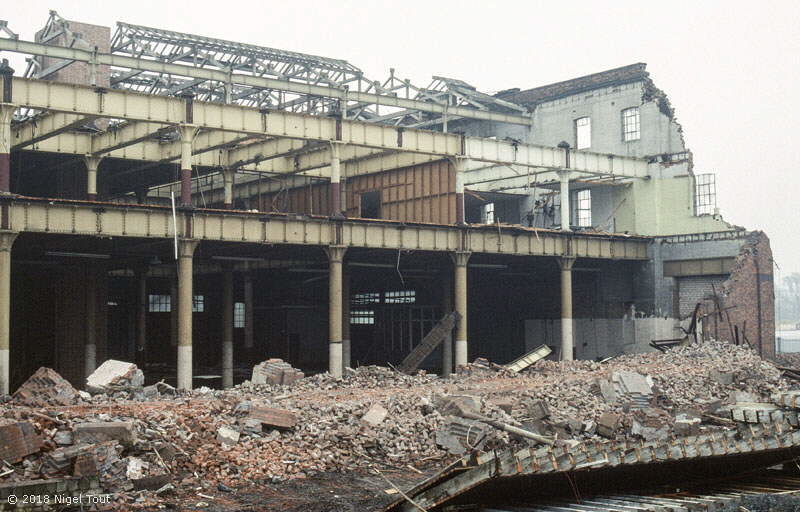 A selection of photographs of Great Central Railway buildings and bridges south through Leicester from the Central station around the time of demolition. 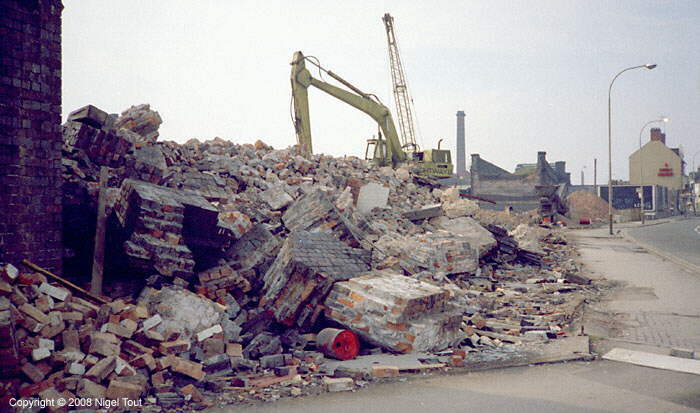 See the page Old Photographs: Leicester Demolition 1 for photographs of demolition south through Leicester to the Central station. Looking south from the Leicester Central Station site with Welles Street in the foreground, 1980. In the distance to the left of centre is the abutment of the bridge over the river and to the left of it is the well known Pex building with the tower crane. Panoramic view of West bridge, just prior to demolition of all the bridges, looking away from the city centre, 1978. West Bridge Street is on the left, Saint Augustine Street in the centre, the river/canal on the right, and Leicester Central station is a couple of hundred yards off the picture to the right. Note the red contractor’s van on the bridge over the river/canal in preparation for demolition. For more photographs of this area see the West Bridge section. The final part of West Bridge Street bridge being removed, looking towards the city centre, 1978. The bridges and viaduct here were the first to be demolished so that improvements could be made to this busy road junction on the edge of the city centre. Demolition of the viaduct alongside Dunns Lane. The top of the ‘Bowstring’ bridge at Braunstone Gate can be seen end-on above the viaduct still standing, and at far right is the ‘West End Inn’ pub which was later renamed the ‘Pump & Tap’. Update May 2002 - De Montfort University has proposed building a swimming pool next to its sports hall, which will require the demolition of the viaduct to the north of the bridge. Since there will be no support for its north end, the bridge will have to be taken down if the plans are approved. 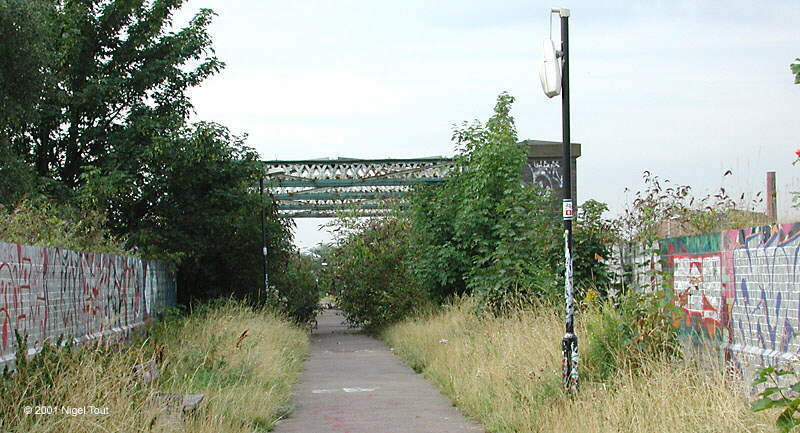 Update July 2005: the route of the Great Central Way footpath is now diverted away from the viaduct and bridge here across the main road, and they both face demolition. The City Council, which is responsible for them, is concerned about the deteriorating state of the bridge and the cost of maintaining it. There has recently been a lot of debate about the future of the bridge by the council and in the local press. Although many would like to see it preserved no one could suggest where the cost of preserving it would come from. The council said that they were open to any suggestions of alternative use, but if nothing is forthcoming in the next year or so then its deteriorating condition will mean that they will have to demolish it. The preserved Great Central Railway would not like to see it destroyed and said that they could provide a home for at least the sides for possible future use if some one were to provide funding to move it to them. 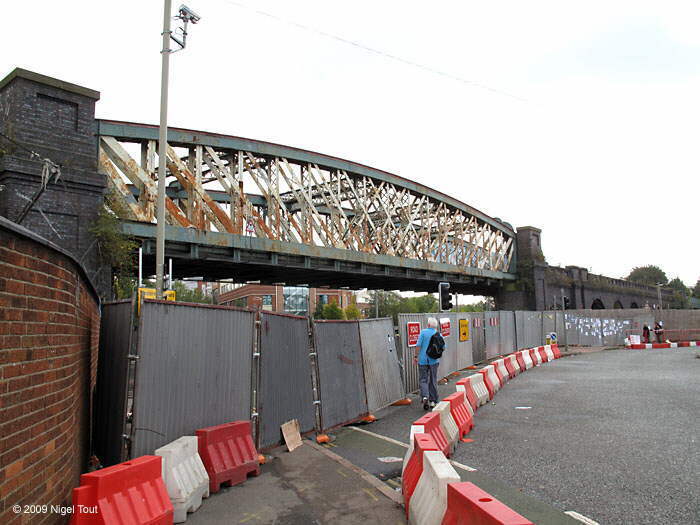 Update January 2006: although it had been hoped to demolish the bridge soon, the Leicester Mercury reported that, since the footpath that had been opened over the bridge had never been legally closed, the bridge is still classed as a public highway. The required Stopping-up Order could take a year to obtain - doh! 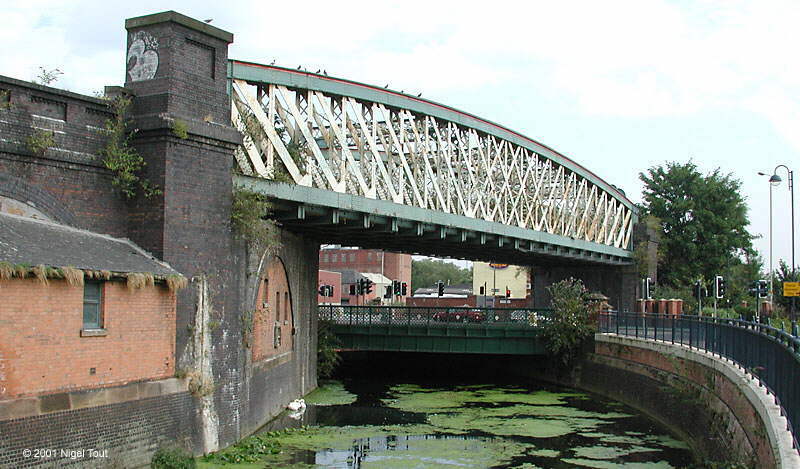 Update 2007 - Leicester Civic Society has started a campaign with a petition to save the Bowstring Bridge. Update August 2009 - The Leicester Mercury announced that the City Council has decided to remove the bridge as soon as possible, expecting to begin around September 21st. 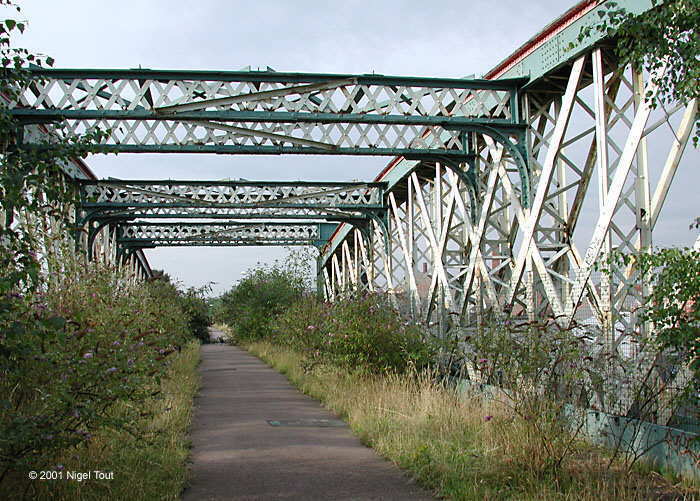 However, Leicester Civic Society has applied to English Heritage for the bridge to be listed. Update September 2009 - English Heritage declined to give the bridge listed status, so although there is a vocal outcry against its demolition the city council is proceeding to have the bridge demolished as soon as possible. 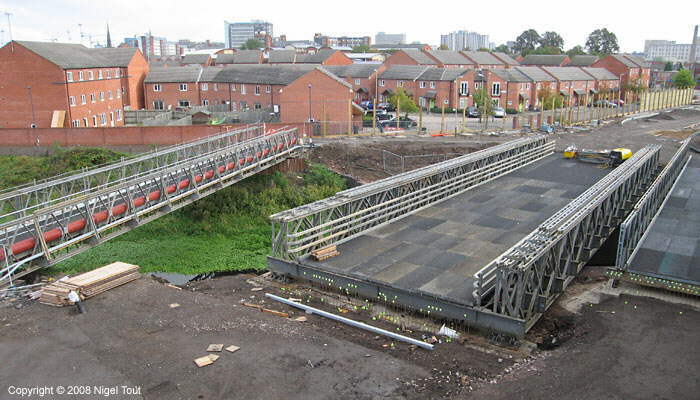 Update October 2009 - Leicester City Council have announced that work on demolishing the Bowstring Bridge is scheduled to start from October 5th. 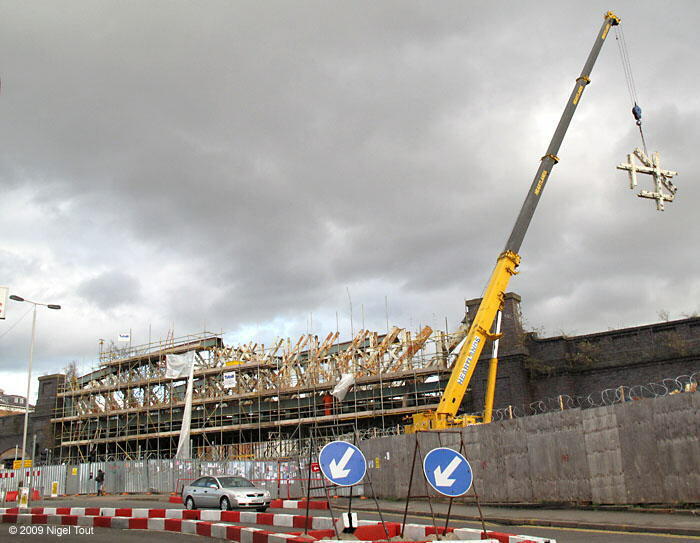 Update November 2009 - Demolition of the Bowstring Bridge is under way; see below. The De Montfort University sports hall is on the left. The new swimming pool would be built subsequently on the right. Looking south under the Braunstone Gate bridge. On the left the new office developments on the GCR goods yard site stretch into the distance. 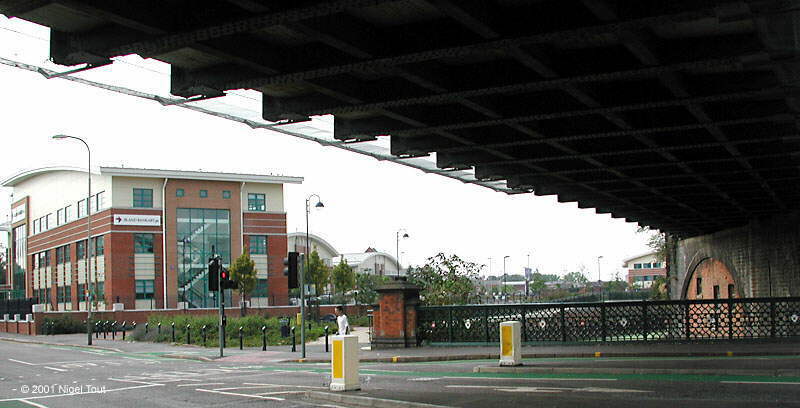 The east side of Braunstone Gate ‘Bowstring’ bridge, with the De Montfort University sports hall on the right. Braunstone Gate ‘Bowstring’ bridge also spannned the Old River Soar as well as the road, here looking north. Taken from the route of the diverted Great Central Way footpath which no longer passed over the bridge. 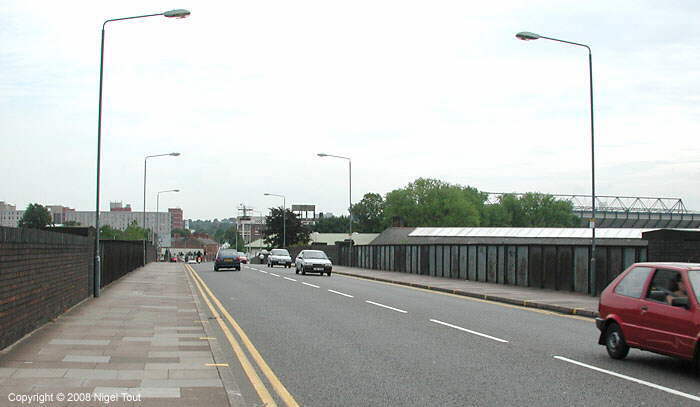 Looking south along the Great Central Way when it went across the Braunstone Gate ‘Bowstring’ bridge. The viaduct walls were totally covered in graffiti. Braunstone Gate ‘Bowstring’ bridge looking south. October 10th 2009 - Demolition contractors have moved onto the ‘Bowstring’ Bridge, which is surrounded by security fencing to keep protesters off. The road underneath may be closed “for up to 3 months”. November 14th 2009 - Demolition is well on the way. Much of the decking and half of the east side have been cut off, and are lying on the road in the foreground. November 17th 2009 - Demolition is progressing swiftly. November 28th 2009 - Demolition will soon be completed. Cutting is well underway on the cross members between the main horizontal girders. 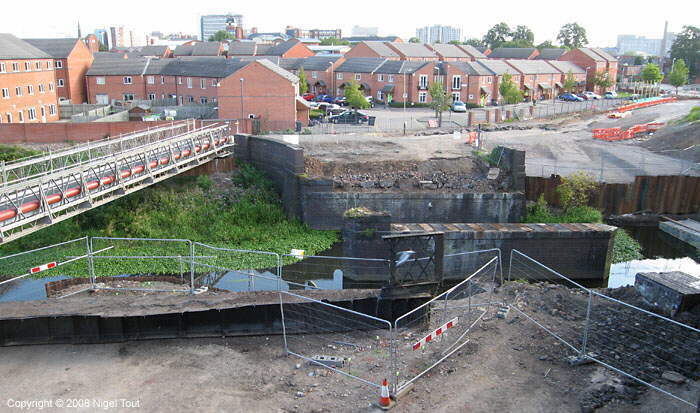 December 1st 2009 - Demolition of the ‘Bowstring’ bridge is now complete. The contractors are removing the scaffolding while the last girders cut down lie on the ground to the right. 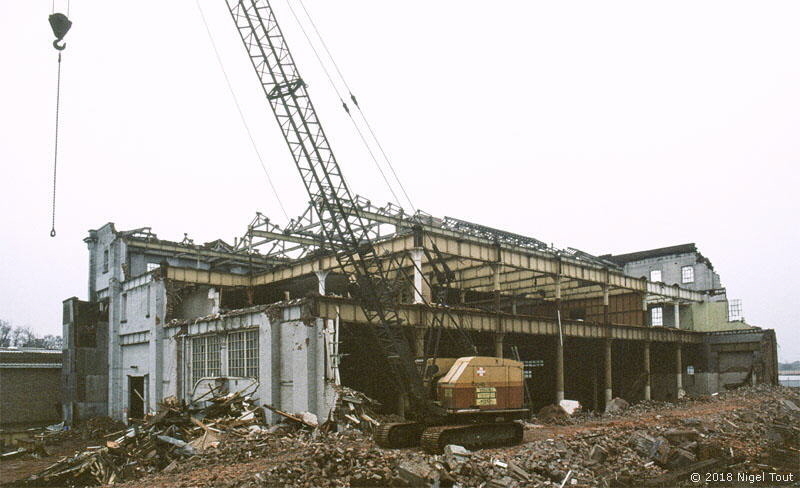 The goods shed during demolition in 1996. A closer view of the goods shed during demolition revealing more of the method of construction. In the foreground on the right lie sections of the flooring which have been cut out. Upperton Road viaduct over the Great Central just south of the goods yard in 2007 just before demolition, looking east. By then the structure was in a poor state, with a leaning brick parapet and rusting ironwork, and had to have additional supports installed underneath (see below). Extra supports under a rusting section of Upperton Road viaduct, looking south. 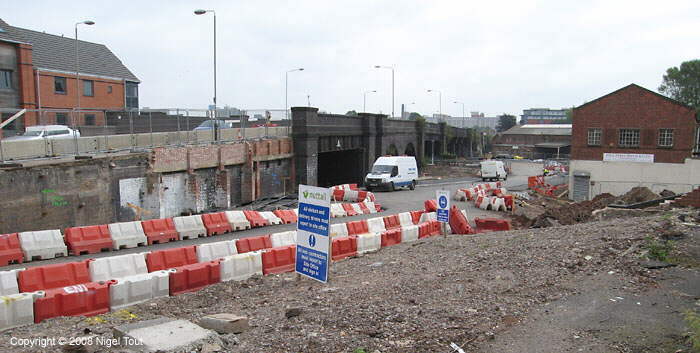 In March 2007 the remaining track under Upperton Road viaduct was being cleared in preparation for the temporary diversionary road which was built for use while the viaduct was demolished. Compare with the photographs further down this page. 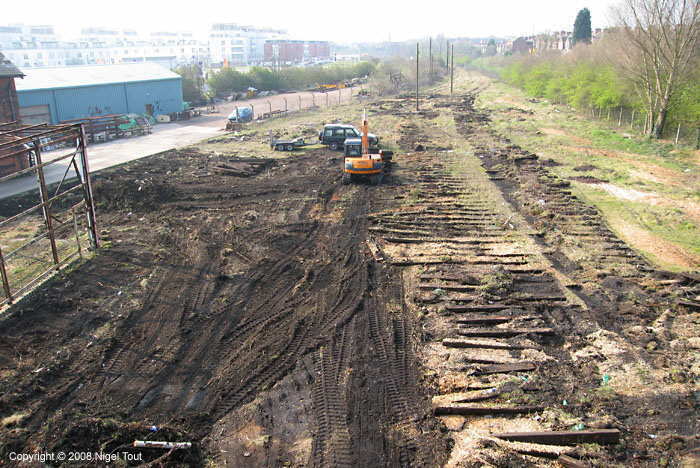 Looking south from the viaduct showing the track bed being cleared for the temporary road. In the distance the rails of the chord leading up to the ex-Midland Railway Leicester to Burton line can be made out. Looking north from the viaduct, in March 2007. On the right are the remaining rails of the sidings and tracks that entered the goods yard while on the left is the Great Central Way footpath and cycle way on the track bed of the main line. 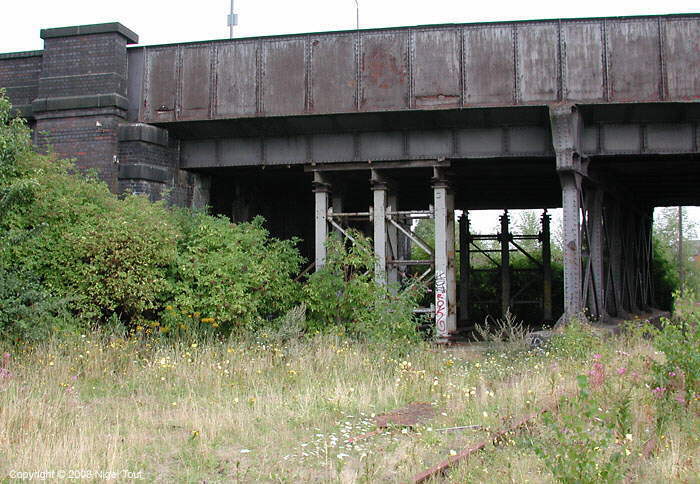 By August 2007 the wide bridge over the Old River Soar which lead into the goods yard had been demolished to make way for a Bailey bridge at a different angle. This temporarily carried the diverted traffic while the viaduct was demolished and Upperton Road relaid. A girder of the old bridge lies in the foreground, on the left, and beyond it a temporary footbridge has already been installed. For comparison, here is the same view as the previous photograph but in December 1973 when the coal yard and scrap yards were being shunted by 0-6-0 diesel shunter number 3400. This view in September 2007 shows the main Bailey bridge for the diverted road in place and just required finishing touches. Looking from the west side of the viaduct in August 2007. 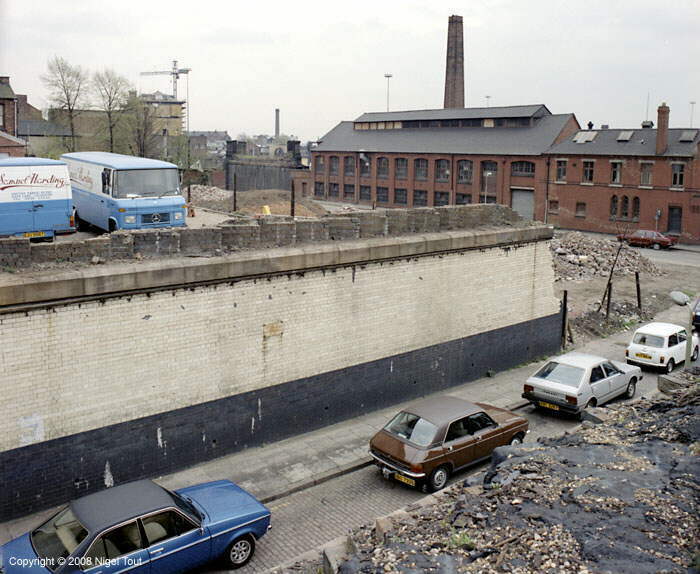 Factories in the foreground had been demolished to make way for the temporary diversionary road and there was now a clear view of the viaduct that had not been possible for many years. 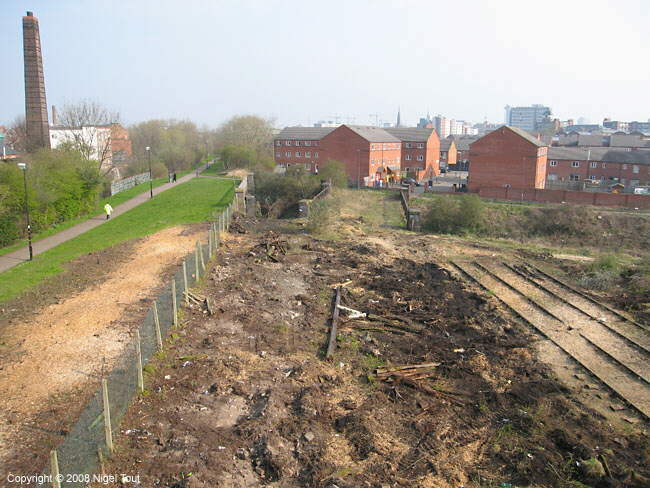 On 21st October 2007 demolition of the viaduct was under way and one steel span on the left had already been removed. A little later cutting had progressed to the next steel span and demolition of the brick abutment on the left had started. 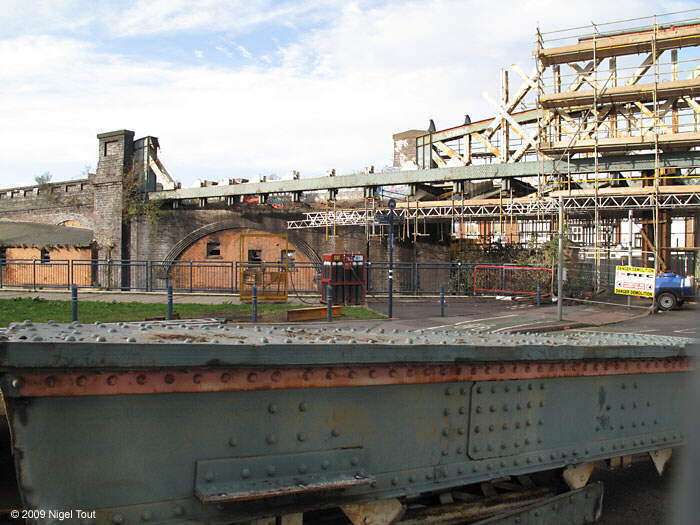 By 27th October 2007 all of the steel work of the viaduct had been removed and demolition of the brickwork at the western end of the viaduct was progressing rapidly. The powerful demolition equipment removed big chunks of the brickwork so the demolition was very quick. In the foreground are two of the mobile telescopic lighting towers with generators since demolition was authorised to continue through each night for the week. 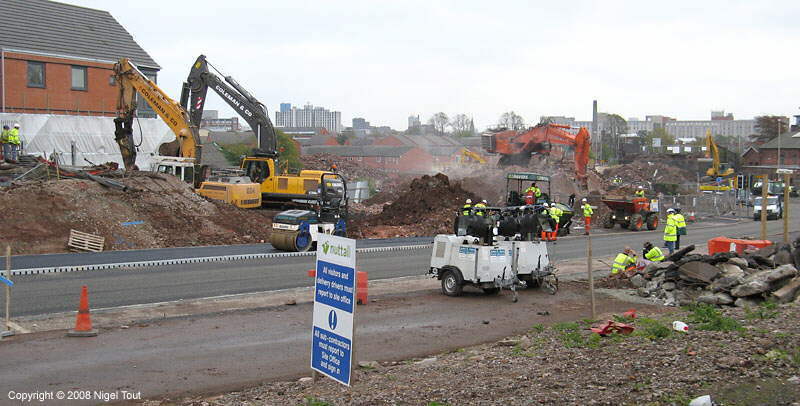 By November 2007 the temporary road was open and the remains of the viaduct were slowly being removed. The pedestrian crossing is where the Great Central Way crosses the road. The car has just crossed the Bailey bridge across the Old River Soar. This temporary bridge was being used while the remaining length of the viaduct over the river was demolished and replaced by a new permanent bridge.